Skin care products help people to maintain the skin care regimen that they need, to be able to have the best skin texture and appearance possible. Skin care products also help people to achieve the skin improvements that they need, and help in obtaining the goals of much improved skin conditions. Skin care products include moisturising lotions and creams, skin lighteners, sun block or sunscreen lotions, tanning oils to darken or brown the skin, and skin treatment products to address certain skin conditions (such as dark spots, wrinkles, acne, whiteheads, blackheads, excessive oiliness or dryness, etc.). It is best to get to know your type of skin first, in order to determine which skin care products will work best for your specific needs. Using the correct skin care products can not only help you achieve the best looking skin possible – they can also help protect your skin so that potential skin problems can be avoided (whenever possible). Type 1: Oily Skin – Oily skin often appears to be shiny with enlarged pores, and is more prone to blackheads and blemishes formation. People with oily skin may experience a greasy texture throughout the day and night. Type 2: Combination/Normal Skin – The combination or normal skin type is characterised by medium pores, healthy color, a smooth and even texture, good circulation, and may tend towards dryness on the cheeks while experiencing oiliness in the t-zone. Type 3: Sensitive Skin – Sensitive skin is characterised by thin, delicate skin texture with fine pores. Sensitive skin flushes or blushes easily, is prone to broken capillaries, more prone to rashes, and can be more susceptible to rashes. Type 4: Dry Skin – Dry skin is characterised by a tight feeling, especially after cleansing. Individuals who have dry skin have a tendency towards the development of fine wrinkles, flaking and red patches. Those who have a darker skin colour may have dry skin that can appear ashy or dull from dead skin buildup. Type 5: Ageing or Sun-Damaged Skin – Ageing or Sun-Damaged Skin is characterised by a tight feeling with visible wrinkles, slack skin tone (especially on the jaw line and the cheeks), with broken capillaries and a leathery texture. Find out about the various Obagi System skin care products to learn how they can transform your skin at the cellular level – so that you can act younger and feel healthier. 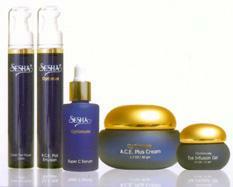 Obagi Nu-Derm System works to accelerate the cellular turnover for skin with moderate to severe sun damage. Obagi-C Rx System is recommended for brighter, Photolumines skin that has mild to moderate sun damage. Obagi Blue Peel System is a peel treatment procedure that is performed in your physician’s office, used in combination with the Obagi Nu-Derm System for a much improved skin condition. Professional-C Serums are potent vitamin C serums that provide maximum daily antioxidant protection for the skin. Obagi CLENZIderm M.D. is a three-step acne therapeutic system that is formulated with proven acne-fighting ingredients. The Obagi CLENZIderm M.D. includes a breakthrough form of liquefied benzoyl peroxide that is clinically proven to penetrate pores deeply and clear acne in a faster manner. As a person ages and the skin takes the abuse of daily living (such as stress, sun exposure, and pollution), the skin’s cell turnover rate slows down accordingly. The new cells of the skin will now take longer to form and reach the topmost layer; the old cells accumulate and stay on the skin surface for a longer period of time. Unwelcome signs of aging will start to be noticeable; these will include: fine lines and wrinkles, uneven skin tone, freckles and age spots, loss of elasticity and loss of natural skin hydration. Sesha Skin Therapy is a science-based skin care program dedicated to the revelation of beautiful skin by feeding and nourishing it from within. Using Sesha’s proprietary and FDA-approved application system, Sesha Skin Therapy delivers the highest quality antioxidants, botanicals, and vitamins where no other skin care system can – to the skin’s regenerative layers. Sesha Skin Therapy products are guaranteed to rejuvenate the skin back to a healthy and youthful glow – regardless of the type of skin concern (whitening, anti-acne, or anti-ageing) that you have.